Ever heard of 1980s band the Lucy Show? Me neither. Isn't that refreshing?" Let's face it, the '80s revival is very stale. I've heard so much new wave I never even want to listen to the Cure anymore, and that makes me sad. If everything new is retro anyway, then why shouldn't I just listen to the originals? Well, for all fans of the '80s sound in its purest form, you're in for a treat. 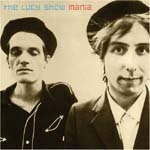 Indie label Words on Music is releasing the Lucy Show's long out-of-print sophomore album, Mania. The London-based foursome (half Canadian, half English) enjoyed a brief and minor success on the British and American college radio charts before breaking up in 1989. Mania is instantly classic and ear-catching, managing to sound both familiar and new. And you've never even heard of it, have you? In the Q magazine review of Mania, published in 1987, the writer makes a point of calling it "unashamedly '60s influenced." This is where a reissue really makes a difference: to me its sound epitomizes the '80s. My first thought was early R.E.M. (who the Lucy Show actually supported on their 1984 Reckoning tour -- how's that for heaven? ), but as the minor keys and twangy harmonicas joined in, I thought: the Smiths. This is not to say that Mania is a re-tread; it's one thing to sound like your influences and another to sound like your contemporaries. The album opens with a double-shot of reverb ecstasy with "Land and the Life" and "View from the Outside." The first time I played the latter my roommate wandered in raving, then saying, "Oh, I thought it was new," while at the same time I wracked my brain trying to place it (seriously, someone help me, where have I heard it?). "View from the Outside" is nearly ridiculous (read: good) in its anthemic status and straight-faced angst. It is '80s to the core to anyone too young to have really experienced them: this song must have something to do with Molly Ringwald, or Jake Ryan, or Hard Harry in Pump Up the Volume. It's interesting to realize that for those of us whose minds have been pop-culture saturated since early childhood, an entire decade can have a sound. To me, the '70s sound like Carole King and Donna Summer; the 1990s like Nirvana and Puff Daddy. You want to hear two sides of the '80s? Play Simple Minds and the Lucy Show and there you have it. This album is great not only due to the moody sadness of songs like "Sad September" and "Part of Me Now", or the jolting bravado of the others, but because it is so pure. The Lucy Show is very different from the Cure, R.E.M., or even Jesus and Mary Chain, because they have not been dragged out of context. Their career consists entirely of two albums, released in 1985 and 1986, and not once since have they experienced new popularity due to movies, commercials, reunions, etc. They have, as of now, been locked into a time and place where they made sense. They have never been appreciated ironically or as "godfathers" of a certain genre, and that alone is a reason to hear them. Do I wish the Lucy Show was still together now? Nah, not really. Mania is not overwhelmingly special, but it is a good album with no filler, no frills, and certainly (for most of us) no surplus of associations. To me albums are like groceries: freshness is key. Is it odd to find that in something 20 years old? The Lucy Show has validated the practice of reissuing records, because it holds true that something old is almost always better than something borrowed.